Today is Dhanteras (a day when Goddess Lakshmi is worshipped for prosperity). The relevance of this day and its mythical allusions can be read in my last years article on the same topic (http://utkarshspeak.blogspot.com/2010/11/dhanteras.html). But today we will not be repeating the same. On this day of worshipping wealth, I would like to talk about a symbol that many of us use without knowing the meaning or the implication of the same. Many of us have seen the Chinese three-legged toad, which is a common Feng-shui symbol for money or generation of wealth. Do we know more on this? Here’s what you might want to know about it. The three-legged money toad is known as Chan-Chu in Chinese. It is one of the most popular symbols of wealth and prosperity and found most commonly in households, offices and more so near cash boxes. It is often depicted as a toad, with read bulging eyes and flared nostrils, sitting atop a heap of coins and a single coin in its mouth. The followers of Feng-shui believe that the symbol helps in creating and protection of wealth, besides driving away evil and bringing prosperity. According to the Chinese myths, the King Money Frog, a mythical king, if seen outsides ones homes on a full moon night, brings good news to the house and this good news could convert into some monetary benefit and thus the association with wealth again. 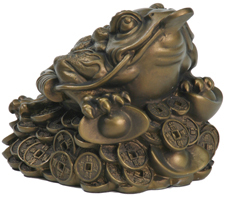 Besides bringing luck and prosperity through wealth, the money frog could also ward away bad-luck which could have been an impediment in wealth creation, again leading to monetary prosperity. Is there any myth involved in the belief of this? It is important to know that frogs and toads (seen as similar) have been seen as signs of fertility and in many cases as harbingers of rain. In any agrarian society, rains ensure prosperity, which is again associated with wealth. One of the myths which though is an astronomical myths is associated with the symbol. According to this myth, Ch’ang O, who was the sister of the water spirit married ShenI, who had just got the pill of immortality. However, to use the pill it had to undergo some rituals and so ShenI left for the same. In the absence of her husband, one night Ch’ang O found the pill of immortality and ate it and soon started feeling light and could fly. When ShenI returned and didn’t find the pill he asked his wife about it. Fear struck Ch’ang O and she flew out of the window. ShenI chased her with a bow and arrow, but the stong winds stopped ShenI from chasing Ch’ang O who was flying higher and higher. Ch’ang O soon reached a place as white and snow and a luminous cold place and started feeling sick and started vomiting and in that she vomited the upper covering of the pill of immortality, which was soon converted into a rabbit as white as could be! But this made Ch’ang O immortal and made this cold place, the moon, as her abode. The God of Immortality then spoke to ShenI and rewarded him for his hard work by giving him the Palace of Sun and transformed to be sent to the sun. But as the sun does, he travels round the universe and once in a year goes to his wife who was sad and lonely. It is said that ShenI then built a palace for her and from then onwards, on the fifteenth day of every moon, he went to visit her and on this day, the moon shone in its full brilliance! Later when they reached the heavens they were honored and later depictions have shown both as god and goddess, with ShenI holding the moon and Ch’ang O holding the moon. I guess you are still looking for the toad, right? Well the Chinese mythology adds a sequel to this myth by saying that Ch’ang O was later changed into a toad, the outline of which is still visible on the surface of the moon! Though the above myth is associated with immortality, the same in the earlier times was a sign of achievement and the end of all woes. Achievement of immortality was in a sense the achievement of the greatest of all wealth, akin to godliness, something that only the gods had. The association of immortality of earlier times with prosperity in modern times is not all that unfound, and the association of prosperity with wealth is definitely not unfound by any standards. So, on this day of Dhanteras, when tradition dictates one to buy gold and silver, the prices of which is trying to kiss Ch’ang O (i.e. the moon), it might be a good idea to buy the Chinese three-legged toad instead! It might just help you to create enough wealth for you to buy the gold or silver next year! On this day, here’s wishing all of you – Happy creation and retention of wealth! Many of us would have heard about “Beware of the ides of March” which was the warning given to Julius Ceaser and was also the day he was assassinated. According to the Roman calendar ‘ides’ was generally associated with the 15th of a month and Julius Ceaser was assassinated on 15th of March. But what is it about the Ides of October? The Ides of October was the day when a horse was sacrificed in the honour of the Roman god Mars (Roman god of war). This was an elaborate ritual which started with a two-horse chariot race. The horse on the right side of the winning chariot was sacrificed at the end of the race. Different scholars have given different versions of the sacrifice, but we will write about the most commonly available versions. Some say that the horse was killed by a spear at the altar of the god Mars. Some mention an elaborate ritual – first the tail was cut off and the blood from the tail was allowed to drip on the altar of the god. The head was also cut off from the body and then decorated with ribbons and other such decorative materials and then hoisted on a spear. Some have mentioned that amongst the decorative materials, cakes made out of bread was also used, giving it a harvest ritual, as grains have been integral to many such rituals. A justification of such a ritual says that it was through the deception of a horse that Troy was won, and this was a ritual punishment meted out to the animal! This sacrifice is also referred to as ‘Equus October’, or the October Horse. Horse sacrifice has been one of the many important sacrifices during the Vedic times and there are many references to Kings conducting Ashwamedha Yagna. In the Vedic times too, the horse running around the kingdoms was sacrificed at the end of the tenure and the run. However, popular mythology has seldom delved in the sacrificial aspects of the Ashwamedha Yagna, except for its running around the different kingdoms who would either accept supremacy of the King conducting the Yagna or wage a war. This shows the intermingling of cultures and civilizations. Many scholars have said that usage of horses in India was adopted after the Greeks invaded India. The mention of Ashwamedha Yagna during the Vedic times might beg to differ with them. However the similarity of the two events by different names, could lead us to the Indo-European marriage of two very different cultures. During one of my recent visit to the Northern India, (Faridabad to be precise), I saw a temple which was called “Maharaja Agrasen ka Mandir”, the temple of Maharaja Agrasen. Curiosity got the better of me and I decided to visit the temple. It wasn’t a very typical temple and there weren’t too many people, besides the fact the temple was closed at that time. I saw some people and enquired about Maharaja Agrasen and also asked some people from the nearby area. From the bits and pieces and a few fragments here and there, this is what I got to know about this ‘god’ who has a temple to himself. 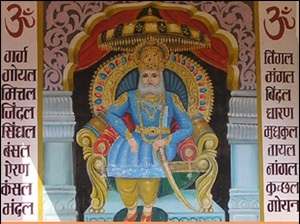 Maharaja Agrasen was a Suryavanshi King (of the solar lineage), who ruled during the Dwapar Yuga, which according to the current times would be approximately more than 5000 years ago. He was the first born of King Ballabha of Pratapnagar. He was supposed to have been married to Princess Madhavi who was a Nagvanshi (the Naaga clan), which brought two very powerful clans of the times together. Madhavi had selected Agrasen in a swayamvar. Here, there is a myth associated with this aspect of Agarsen. It is said that in the swayamvar, Lord Indra too was present and was infatuated by Madhavi’s beauty. But Madhavi’s selection of Agrasen, angered Indra and he was so jealous about it that he decided to not to send any rains to Pratapnagar which soon had a famine like situation. King Agrasen then waged a war against Lord Indra and since he was on the right side of Dharma, Indra and his mighty forces were soon vanquished. Indra then sought the help of Narada to mediate and settle the matter amicably. This proclaimed Agrasen as a righteous and a religious ruler who would wage a war against even gods for the welfare of his subjects. After this, Agrasen decided to propitiate Lord Shiva who was soon pleased by his penance. Lord Shiva then advised him to propitiate Mahalakshmi, who too was pleased with the penance. She appeared and blessed Agrasen and suggested that he give up the role of a King and change his caste to Vaishya, the business community and found a new kingdom and she would bless all his people. King Agrasen, then gave up his Kshatriya-hood and became a Vaishya. Agrasen was a very compassionate person and the happiness of his subjects was his prime concern. He conducted many yagna’s for the well-being of his people and once during the well-known 18 maha-yagna’s, during an Ashwamedha Yagna, he saw a horse being pulled to the sacrificial altar and the horse resisting it. He felt very sad seeing the pathetic plight of the animal and decreed that there would be no more animal sacrifices. He became a champion of Ahmisa and was of the opinion that prosperity could not be brought at the cost of death of animals. He later divided his kingdom amongst his 18 children, and named the 18 gotra’s after the gurus of each of his sons. Some of these are Mittal, Bansal, Goyal, Jindal, Tayal, Bindal, amongst others. Finally the most important aspect of this legendary king, is that the present day Agarwal community trace their origins from Agrasen. N modern day Delhi, one can see Agrasen ki Baoli, which is supposed to have been built during the Mahabharat epic times and later rebuilt by the Agrawal community in memory of their ancestor, Maharaja Agrasen. This is a classic case of deification of a human being. Here is a person who has a historic reference and modern day people can trace their lineage to him. To lend credence to his importance in the process of deification, there is the classic reference to Lord Indra, which gives him an edge in being worshipped as a god. It is also quite logical to involve Lord Indra, who is a much maligned Puranic deity, but to be on the right side of the dharmic-diplomacy, is also a worshipper of Lord Shiva and Goddess Lakshmi. Also change of the caste is shown as God’s desire; otherwise changing of caste is a relatively unknown phenomenon in any of the texts. All in all an interesting piece of mythology – just goes on to prove the theory that every mythical hero probably was a part of history, once the finery of fantasy is removed from the bare facts of the reality of times. Thanks to a political party and its usual eye-balls grabbing efforts, “shastra-puja” or weapons-worship on Vijaya Dashami day is being discussed. So what is “shastra-puja” and its relevance if any? The origins of this can be seen in the epic Mahabharata. According to the epic, when the Pandavas lost in the game of dice with the Kauravas, their cousins, they were supposed to spend twelve years in exile and the thirteenth year was supposed to be in agyantvas – to be spent in total anonymity without being recognized. When the Pandavas entered into the thirteenth year, they hid their weapons in a Shami tree, before disguising and entering kingdom of King Virata. On the day of Vijaya Dashami, and also the end of their agyantvas, they retrieved their weapons from the Shami tree and performed a ritual worship of the weapons. They then, identified themselves as Pandavas and defeated the Kauravas who had attacked King Virata. Since then, it has been a practice for Kings to perform shastra-puja on the day of Vijaya Dashami – which is also the symbol of victory of good over evil. 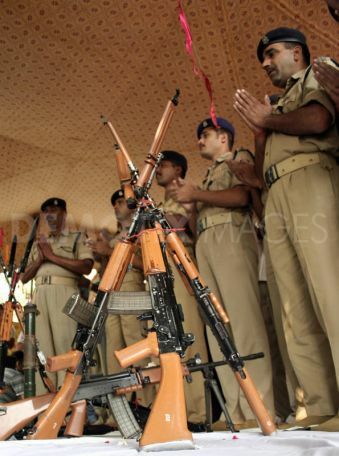 Over a period of time, this shastra-puja is undertaken by many who deal in weapons and also implements. People in Security agencies, army and other forces and even business men who have heavy plants and machineries perform the puja as a ritual. How a political party benefits from “shastra-puja” can be anybody’s guess, except for a political gain. But thanks to some elements I get my topics to write! Here’s wishing all my readers a very happy Dasshera & Vijaya Dashami! The eighth day of Navratri is associated with Goddess Bagala – Bagala or Bagalamukhi, or ‘crane-faced’ is a form of the Mother goddess. Some also interpret the name with bridal face, implying the face which has the power to attract attention, like all brides. The worship of the goddess is generally in the tantric form when opposite behavior is warranted. The worship enables opposite reaction of what is normal, implying that she has the power to turn speech into silence, movement into motionless, power into impotence, etc. It is this reason why she also referred to as “stambha-shakti” the power to stun. Her worship is very ritualistic and a lot of care is undertaken in the rituals, as any error could earn the wrath of the goddess. There are quite a few temples of the goddess and the greatest boon that one can receive on worshipping at the temple of Bagala devi is to have worshipped all the 330 million gods in the Hindu pantheon just by worshipping at her temple. One of the myths associated with the goddess is that once a huge storm waged on the earth threatening to swallow the whole earth. All the gods assembled and prayed to Bagala Ma, who appeared and calmed the storm. Another legend says that the goddess defeated an asura to protect Dharma. She is supposed to have pulled out the tongue of the asura who begged for forgiveness – implying that unwanted speech or discussion is a threat to religion and the goddess does not forgive such people. In the ancient times animals were sacrificed during the ritual worshipping and some say that the practice is followed even now. The ninth day is associated with Goddess Matangi – Matangi is again a ferocious aspect of the goddess and again a form worshipped in the tantric form. 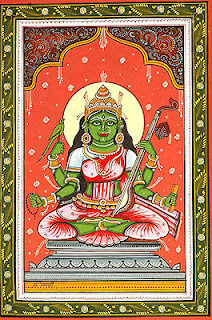 Matangi is the tantric goddess of speech and the knowledge of arts like music, etc. and is thus as the ‘Tantric Saraswati’. She is generally worshipped to gain supernatural powers and a victory over enemies. The myths associated with Matangi are very similar to the ones of Sati or Kali, but the details of the myths are not very elaborate. However, different tantric texts also relate many other myths which are replete with sexual undertones (which are not being mentioned here as the same have not been verified by me). Some texts have also compared her to an outcaste, a ‘chandala’, and thus sometimes she is also referred to as Chandalini. Some say, that she was the daughter of Sage Matanga, who was an outcaste but became a rishi with his penance and thus Goddess Saraswati was born as his daughter, which was goddess Matangi. Different texts have said different things about Matangi, but what is common to all is her ferocious aspect. The Navratri is the celebration of the Mother Goddess cult in India. It involves the worship of the primordial female energy, the energy which gives birth to new life and generative power. The worship of mother goddess cult can be seen all across the world in different forms. Egyptians worshipped Mut, Isis and a few others, the Babylonians worshipped Tiamat, and the Sumerians worshipped Innana. The Greeks had the cult of Cybele, besides the worshipping of Gaia and Rhea. Similarly, the Irish, the Nordic and all the major cultures of the world had the concept of a mother goddess cult. So what is behind the cult of Mother Goddess that is so prevalent across the world which has some cultures still following the rituals associated with it? In all major cultures, creation was either by a single unidentified (or not so distinctly clarified) principle or a male principle with the help of a female principle, but the initiation was by a single dominant force which ‘seemed’ to be male. But the successive generations came with the help of a female principle for both human beings and other living organism. Even if science had not proven that this union was necessary, this had been assimilated well by the primordial man, and thus emerged the significance of the cult of a goddess who soon took the form of a Mother Goddess. The concept of mother goddess was also similar to the concept of Earth goddess in many cultures, which takes one back to the principle of fertility and the concept of fertility goddesses and rituals associated with it. The fourth day of the Navratri is associated with Godess Bhuvaneshwari – Bhuvaneshwari is one of the important forms of the Mother Goddess, who is responsible for giving a form and shape to the universe. She gets her name from the words ‘bhuvan’ meaning universe and ‘eswari’ meaning the ruler. 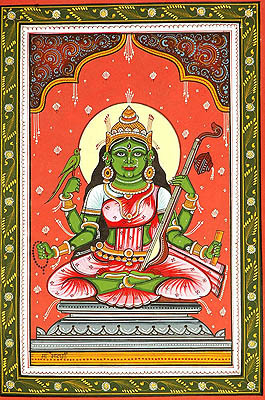 She is invoked by uttering “Hreem” which is considered to be as powerful as the “Om”. She is always depicted as smiling and two of her four hands are always in the blessing form. She is bedecked in gold jewelry and is supposed to be residing in “manidwipam”, a land of gold, silver and jewels, which is guarded by powerful gods like Agni, Vayu amongst others. She is a giver of boon, which not only includes material forms, but also knowledge, health and happiness. She thus seems to be the embodiment of later goddesses like Saraswati, Lakshami and even Parvati. The sixth day of the Navratri is associated with Bhairavi – Bhairavi is another terrifying form of the goddess which sometimes gets confused with the Kali form of the goddess. Bhairavi is also referred to as Baala or Tripurabhairavi and as part of the nine day battle waged by Goddess Durga, when she entered the battle field, the asuras ran away in fear. She however, killed the two fearsome asuras Chanda and Munda and thus is also referred to as Chamundeshwari. Besides the two, she is also supposed to have killed two of the most important asuras - Shumbha and Nishumbha. Bhairavi, is shown on a donkey when angry. At the end of the day, these are different form of the same Mother Goddess, i.e. Goddess Durga.